The latest release of Microsoft's messaging system allows for easier access to e-mail, voicemail, and calendars from a variety of devices and any location while also giving users more control and freeing up administrators to perform more critical tasks. 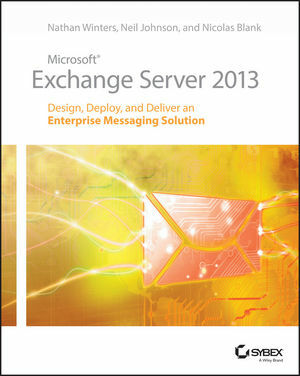 This innovative new field guide starts with key concepts of Microsoft Exchange Server 2013 and then moves through the recommended practices and processes that are necessary to deploy a top-quality Exchange service. Whether you're upgrading from Exchange Server 2010 or earlier, installing for the first time, or migrating from another system, this step-by-step guide provides the hands-on instruction, practical application, and real-world advice you need. Nathan Winters is an Exchange Technical Specialist at Microsoft UK. He has worked with many of the UK's largest companies across all sectors, helping them understand the value of their messaging platform and deploy Microsoft Exchange and Lync Server. Before joining Microsoft, he founded the Microsoft Messaging and Mobility User Group UK. He is a four-time MVP for Exchange Server and a regular speaker at major industry conferences in both the U.S. and UK. Neil Johnson is a Senior Consultant with Microsoft Consulting Services in the UK. He has over 16 years of experience in enterprise design and architecture, and is the author of the Exchange Client Network Bandwidth Calculator and the Jetstress Field Guide. Neil can often be found presenting at external events such as TechEd or Microsoft internal product events. Nicolas Blank has more than 15 years of experience with various versions of Exchange, and is the founder of and Messaging Architect at NBConsult. A recipient of the MVP award for Exchange since 2007, Nicolas is a Microsoft Certified Master in Exchange and presents regularly at conferences in the U.S., Europe, and Africa. The first sentence under "High Availability," "Exchange 2000/2003 could be clustered in order to archive high availability." 3 47 Text correction: Error under "MAPI in Exchange 2013"
The last sentence of the first full paragraph, "Exchange 2013 reduces the available transport mchanisms for MAPI down to TCP."